The city of Nome is in Northwest Alaska, on the Seward Peninsula. Nome is a coastal Bering Sea community located on the northern coast of the Norton Sound. Nome is not serviced by the Alaska Highway system, so can only be reached by air or via water and some snowmobile/dogsled trails. There are no ferries that serve Nome. Alaska Airlines 1-800-252-7522 operates two scheduled passenger flights per day from Anchorage. Bering Air (907) 443-5464 offers service to and from the surrounding villages and Kotzebue, and chartered flights to the Russian far east. Ravn Alaska 1-800-866-8394 / 907-266-8394 offers service to and from several of the surrounding villages. 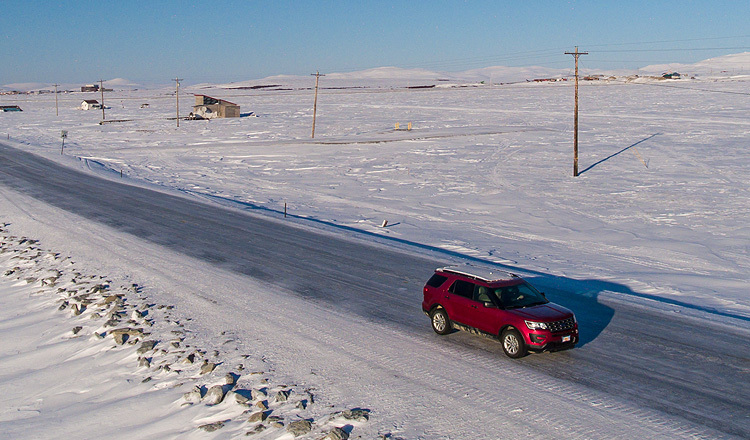 Nome airport is approximately 1.4 miles from downtown Nome. Taxi Service is available to and from the airport and town, and rates are generally $6.00 per person one way. Conveniently located at Aurora Inn and Suites, Stampede Car Rentals offers reasonably priced car rentals with unlimited mileage. Our fleet consists of 50 vehicles, all late model Ford and all 4WD. We have trucks, vans and SUV’s available.